It always makes me wonder how do they place the cameras and crew members while filming a scene which is opposite to a reflecting object, such as mirror. Because, when filming the reflected objects we should see the camera and cameraman because of their reflection. But this does not happen in the movies. How do they film the scenes with an actor facing a mirror? Why don't we see the cameras and crew? 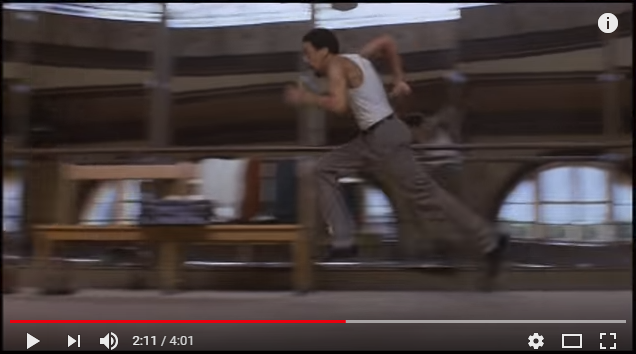 What is the technique they use to film the scenes with reflecting objects? If you look closely, you'll almost always note that the mirror is angled so the camera is out of its view. This is sometimes masked by the actor looking directly into [the reflection of] the camera, which gives the impression that he is looking at himself in the mirror. one is using visual effects (optical or CGI) for the reflection. The other was used by James Cameron in Terminator 2: Cameron wanted a tracking shot (camera moving sideways) behind Linda Hamilton removing a chip from Arnold's head in front of a mirror. If done with a mirror, the camera would have been visible as it moved around behind the actors. Rather than do this with effects, the set was built so that the mirror was actually a window, and on the other side was a complete mirror-image version of the set on the camera side. Schwarzenegger and Linda sat on the far side facing the camera, and a fancy Arnold puppet and Linda's twin sister sat with their backs to the camera, mimicking all of the moves of their counterparts. One simple way is to use tilt-shift lens. It's often used by photographers for static images although I'm not sure if it's commonly used for animated movies or not. Simply put the camera aside from the mirror then shift the lens towards it. The perspective will be fixed by the lens so that viewers will think that the camera is in front of the mirror. However those lenses are very expensive so nowadays people may use a normal lens then correct the perspective later by Photoshop, Premiere or similar software. There are several techniques when mirrors or reflective surfaces are involved in movies. One is simply to remove digitally the camera and the crew that could appear in the reflection. Sometimes this (already classic) technique involves taking pictures of the real set, and using them to "cover" what should not be in the image. There are many ways to do it, depending on the scene. A common way to do it is with post processing, by covering the camera with an image of the same static background before placing the camera. This is a very old question, and there are some good answers. 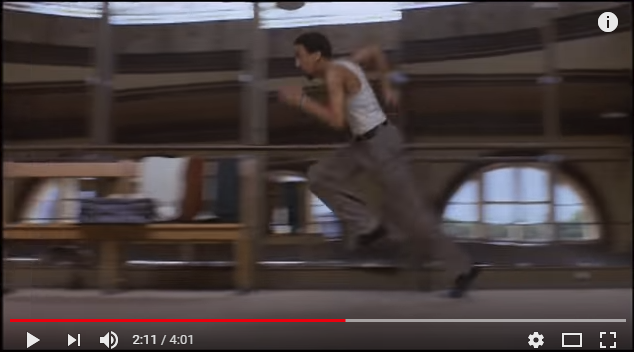 I just wanted to add another excellent example from the movie White Nights (1985), starring Gregory Hines and Mikhail Baryshnikov. 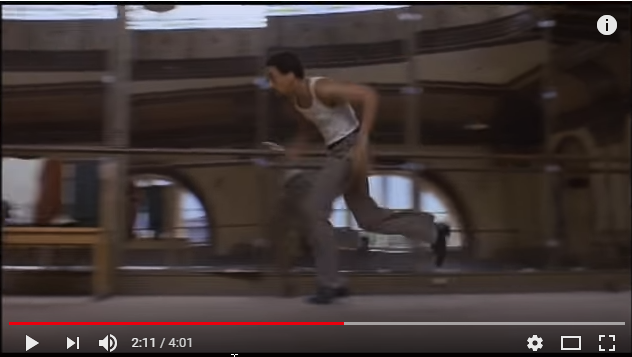 In the scene where Gregory tap dances in a studio, the camera pans with him as he runs in front of a wall of mirrors. You can see it at 2:11 in the YouTube video below. I had to watch the movie twice in a theater to figure out how they did that! If you look closely, you'll notice that Gregory's reflection disappears briefly. That's because the two mirrors that should be reflecting the camera are actually angled slightly away. Specifically, the mirror to the right of the camera is angled to the right, and the mirror to the left of the camera is angled to the left. Neither of them reflect the camera. 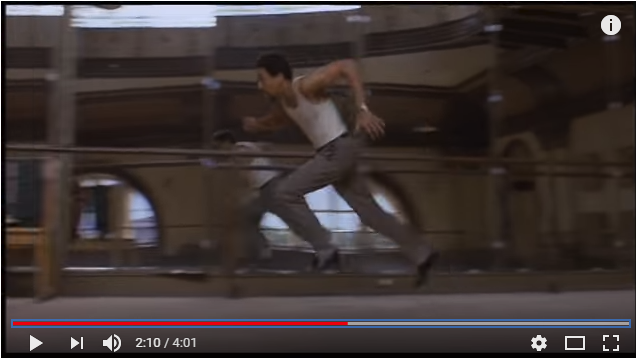 You can see this when Gregory runs past; his reflection disappears for a few frames. The third picture above doesn't show his reflection (and not just because he's blocking it). How was the scene of the mirror in “Mr. Nobody” recorded? Why can't we see the camera? How was the cameraman removed from the mirrors in the elevator scene? How do they show a tooth-less mouth? How is dialog between two people filmed? What is the movie term for only seeing what is on camera?